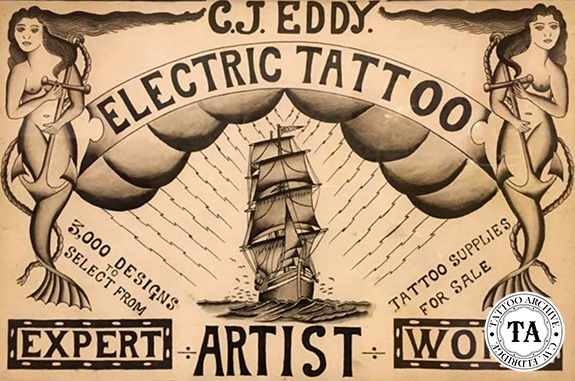 Clement John Eddy, also known as "Pop" Eddy tattooed in San Francisco, California. He worked at several different locations in that city, including #1138, #1116 & #1034 Market Street and #4 Embarcadero. At the Embarcadero location Eddy worked with E.C. Kidd. 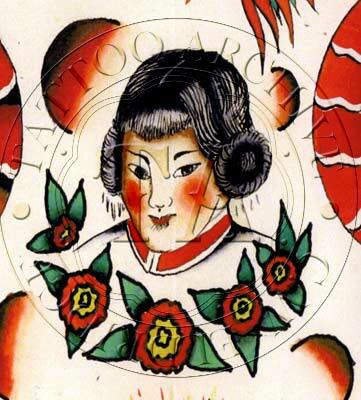 A card from the 1930s has Eddy billed as the, "Celebrated Skin Engraver." The #1116 Market Street shop was shared with Herb's Barber Shop. On a business card from this shop, Eddy stated he had 42 years of experience. Being connected with a barber shop was a common set-up in New York City, but rarely seen on the west coast. In fact, this is one of the few west coast shops I have seen connected with a barber shop. Eddy built machines that were popular in his era. One of his shop signs stated that he had "tattoo supplies for sale." It is unknown if he sold supplies besides tattoo machines. Pop Eddy died in San Francisco in 1957 but many solid brass machines and nicely painted sheets of flash are still around to remind us of him. C. J. Eddy Update 2006! Lately we have been corresponding with C.J. 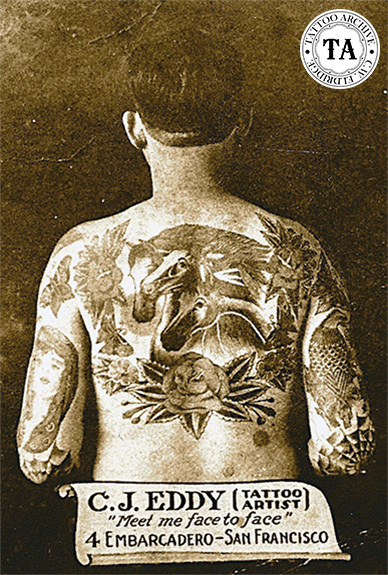 Eddy's grandson, Bill MacDonald, and have been able to gain more information about this west coast tattooist. "C.J. Eddy was my grandfather, or as the family called him Clem. I believe he grew up in Nevada City. I don't know too much about his early life, except that his father was run out of the state for high grading gold ore.
After WW2, C.J. went to work for Eureka Mills in the Mission (San Francisco) and supervised the mill. When the Korean War started he went back into the tattoo business on Market Street. He used to say the WW2 sailors were a tougher group than the Korean War sailors. I was pretty young but I remember the dining room table filled with plastic sheets of designs he did. The frames for his machines were made at Poly High School. I remember taking a streetcar up to Poly with him when he collected the finished frames. I imagine the teacher had the students make the frames as a project and the teacher made a little money on the side. C.J. had a little workshop in the basement; maybe 8 x 4 feet where he assembled the machines. He was talented man in many areas. In the summertime during the war, he had a very large victory garden in his back yard. After the war he filled it with dahlias and a hot house full of begonias. Some of these he developed himself. I was about 17 when he died. All the machines and plants were sold."